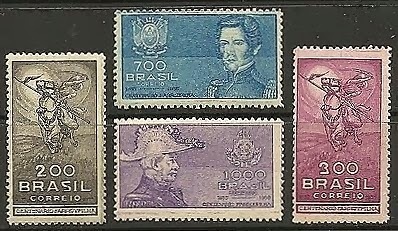 In 1935, Brazil issued a set of four stamps commemorating the "Ragged Revolution" (also known as the Ragamuffin War), which is considered the second bloodiest of the failed wars of independence in the Brazilian Empire, after the War of Cabanagem (Scott #407-10). 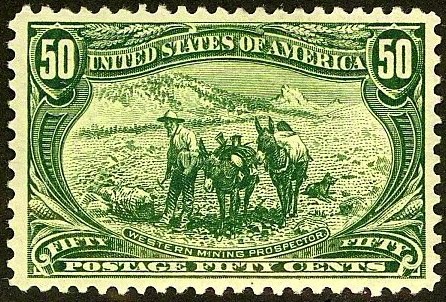 100,000 sets were issued, and Scott '14 prices the unused set at $12.30 . This is a very inexpensive set, considering Brazil's population and prospects for economic growth over the coming decades. With 191 million people, Brazil is the largest economy in Latin America, and the world's eighth largest. Political and economic reforms have given the country a brighter future than it had in the bad old days of oligarchical dictatorship. The Brazilian economy is diverse, the country is aggressively investing in its future by generously funding technological research and education, and exports are booming. Annual GDP growth has averaged a little over 5% over the last 5 years. There are a number of undervalued Brazilian issues with printing quantities of 10,000 to 100,000, some of which have topical appeal, and recommending them for accumulation seems a no-brainer. Brazil looks destined to become an economic superpower, and even if it mirrors the philatelically anemic U.S. and only one out of a thousand Brazilians become serious stamp collectors, they'll be competing for their nation's better stamps, only to find that the cupboard is bare. "The Stamp Specialist" blog features my buy prices for stamps which I am interested in purchasing. I've posted a buy list for Brazil. Viewing dealers' buy lists every now and then is an excellent way to keep up with the vagaries of the stamp market.